The Nebraska Agricultural Water Management Network (NAWMN) ETgage project is one part of a system for testing cutting-edge technologies and creating a network with growers, UNL Extension, NRDs, NRCS, crop consultants, and other interested partners, that will enable the adoption of water and energy conservation practices. 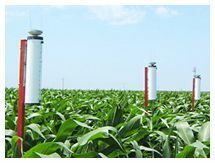 Atmometers (ETgages) are designed to simulate evapotranspiration (ET) from a plant canopy in a way that agrees with a plant's resistance to ET. The ETgage is a tool that can be used to mimic ET rates and this information can be utilized for irrigation management. The simplicity of use and interpretation of the ETgage data, as well as the economic feasibility, make it easy for farmers and consultants to monitor crop water use and irrigation needs. For more information please see the "Using Modified Atmometers (ETgage®) for Irrigation Management" Extension publication. Participating producers, consultants, NRD personnel and Extension Educators across Nebraska are uploading weekly ETgage information to this site. If you'd like to see the data from your area, simply go to the to see the data from your area, simply go to the View Weekly ETgage Data page and click on your county. You will then see a GoogleTM Map view of county that has the ETgage sites marked. If you are using the watermark sensors, knowing the soil type of the field is also important. Please see the soils chart (PDF file) which includes suggested irrigation trigger points. For more information on this topic, please see the UNL Extension publication "Watermark Granular Matrix Sensor to Measure Soil Matric Potential for Irrigation Management" (PDF). To utilize this information, you need to know your crop's stage of growth. For example, 4 leaf corn will use much less water than tasseling corn. You can get information on crop coefficients (Kc) for various crops and stages of growth information on the Growth Stage Charts page. Each ETgage site data page will also show information relative to the dates given. If you have an ETgage and would like to upload your information, please complete the ETGage Site Registration information. You will be assigned a site name that you will use to login and will then be able to load your weekly ETgage changes. You need to have an accurate address for your ETgage site so that Google MapTM can locate your ETgage site. This ETgage Web application is managed by Aaron Nygren, Extension Educator, Colfax County, with the help of IANR Communications & Information Technology personnel. Suat Irmak is the Project Coordinator for the Nebraska Agricultural Water Management Network.